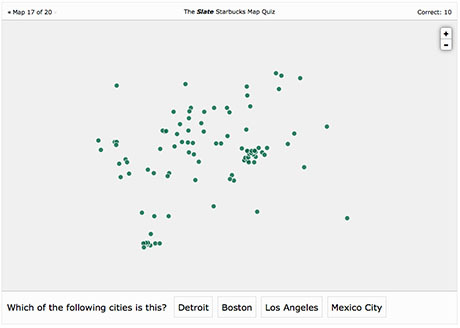 This is too much fun not to share: Slate is challenging its readers to identify world cities purely by the geographic pattern of their Starbucks locations. In the interest of not spoiling your fun, I won’t post any of the answers, but I will say that if you know the basic shape of the city in question, and you bear in mind that many Asian and European cities are more densely packed and core-centric than their North American counterparts, it’s possible to get a decent score. Go play!